Communication blackouts and blocked roads were hampering rescue efforts Wednesday as Papua New Guinea worked to get a better grasp of the damage wrought by a massive earthquake amid fears of its economic impact. The 7.5-magnitude tremor struck 90 kilometres (55 miles) south of Porgera in the Pacific nation’s mountainous Enga province early Monday, with sporadic aftershocks continuing to rumble through the rugged region. Local media reported that aerial surveys of the worst-hit areas showed countless roads, bridges and infrastructure destroyed, along with private homes. Access, however, was difficult with roads blocked by landslides and sinkholes. 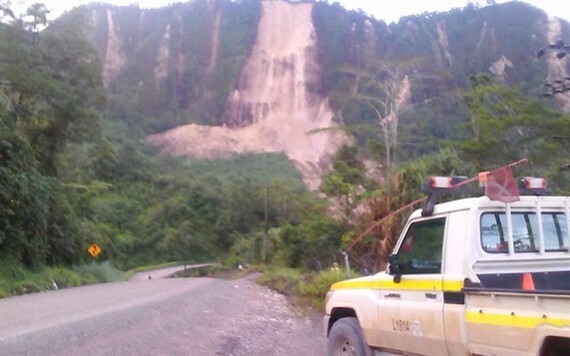 The PNG Post-Courier newspaper had on Tuesday said more than 30 people may have died, although on Wednesday it reported that only 14 had been confirmed, in the Southern Highlands and Hela province. All were killed when their houses collapsed as they slept, it said. No official death toll has been provided. Government assessment teams were at work, with the military mobilised to help restore services. Australia said it had sent a transport plane to conduct aerial surveillance and provide logistical support to the PNG Defence Force after a request by Port Moresby. "We are saddened to hear reports of lives lost and many people being injured," said Australian Foreign Minister Julie Bishop. "Given the challenging terrain and remoteness of the area, we expect that the extent of the damage will become clearer in coming days." Hela deputy administrator Eddie Yuwi told The National newspaper the province resembled a war zone. "Within the periphery of Tari town, we have all the roads affected, buildings destroyed, we have a number of casualties which are yet to be established," he said. "We have millions of kina (local currency) worth of property destroyed. We have people buried by debris, landslides." He added that a large crack had opened up at Komo airport, which services crucial nearby gas fields. Prime Minister Peter O’Neill tried to reach Hela on Tuesday but poor weather forced his helicopter to turn back. Impoverished PNG’s economy is heavily dependent on its natural resources and he said the temporary closure of oil and gas fields in the area would be felt. "The closure of the oil fields and the gas fields is a concern to every one of us," he told reporters, adding that the country’s National Executive Council would meet Wednesday to work out a plan of action. "It will have a huge impact on our economy, but we will work with experts to see if we can get them operational as quickly as possible." O’Neill added that the government was getting regular reports from ExxonMobil, the operator of the gas fields, and from Australian-listed exploration company Oil Search. Oil Search has demobilised non-essential staff as it checks for damage, while ExxonMobil has shut down its Hides Gas Conditioning Plant in Hela. Earthquakes are common in PNG, which sits on the so-called Pacific Ring of Fire, a hotspot for seismic activity.